Everyone wants a piece of the huge financial and cultural success that is Star Wars: The Force Awakens. Even Astrobites has already jumped onto that bandwagon. You might say this is bad form, for a scientific blog to talk about such nonsense as “The Dark Side” and “The Force” that surrounds us and permeates the whole universe? The “Missing Satellites Problem”: the regular LCDM model greatly over-predicts the number of satellite galaxies that the Milky Way should have, as shown in this simulated image. What if I told you it was true? All of it. Okay, maybe I exaggerate a bit. But the current best model of our universe does involve a “dark sector”: strange forces and particles we don’t yet understand well. This is the LCDM model of cosmology: L for “Lambda” — which stands for Dark Energy — and CDM for “Cold Dark Matter”. Dark Energy is a “force” that pushes against all galaxies in the universe, accelerating them apart. Dark Matter, in contrast, makes up more than 90% of the mass in most galaxies — it is truly what “binds the galaxy together“. As a whole, the LCDM model explains vast amounts about our universe. But there is a major flaw (in the simplest version of the model). It predicts galaxies like our Milky Way should have many hundreds of smaller satellite galaxies around them, compared to the few dozen we observe. This is the “Missing Satellites Problem“. One way to solve this conundrum is to posit the existence of dark galaxies. These would be made entirely of dark matter, with no stars in them. They may have formed this way, or have formed with gas in them but just never cooled enough to form stars. Maybe the Milky Way is surrounded by hundreds of satellites, but most of them are just too dark for us to see. Fig 1: As the dark satellite (purple) merges with the galaxy, it distorts the disks of gas (top) and stars (bottom) into forming tidal tails. In the tails, the gas density rises enough to form new, young stars (blue). Figure adapted from Starkenburg et al. 2015. The authors of today’s paper suggest ways we could detect the existence of dark galaxies, through their interactions with the gas and stars of observable galaxies. The authors run a suite of simulations involving small dark satellites merging with low-mass dwarf galaxies. They choose to study dwarf galaxies because they should be more strongly influenced by a dark satellite than a more massive Milky-Way-like galaxy. The authors run hydrodynamical simulations, which include gas physics as well as gravitational effects. This is a very important step, as it allows them to study the formation of new stars from the gas when it gets stirred-up by the dark satellite. The movie to the right shows one example from their simulations. When the dark satellite passes close to the galaxy, it distorts the galaxy’s disk into tidal tails. The gas density rises in these tails, which helps form new stars. The authors suggest that this could be used as a signature to the existence of dark satellites. The authors use several measurements to quantify how much galaxies were disrupted by the merging dark satellites, which are shown in Figure 2. Asymmetry increased significantly when a dark satellite passed by a galaxy, but quickly went back to normal levels once things settled down. Concentration — which measures whether the galaxy is clustered around its center or is spread-out — rose and stayed elevated after the merger. Using these results, the authors argue that we could detect the presence of dark galaxies through their effects on dwarf galaxies when they merge. 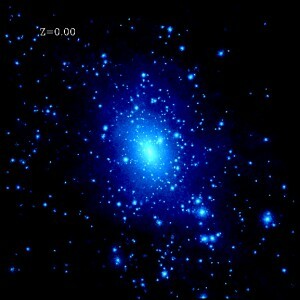 A very asymmetrical dwarf galaxy may be undergoing a current merger with a dark satellite. 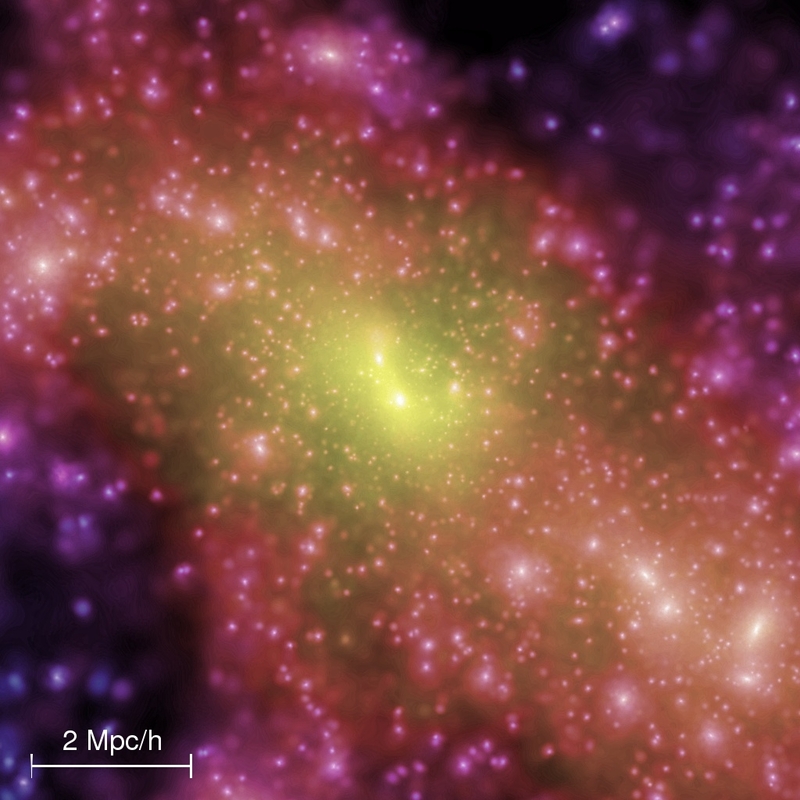 Alternatively, a galaxy with unusually high concentration may have had a dark merger in its past. 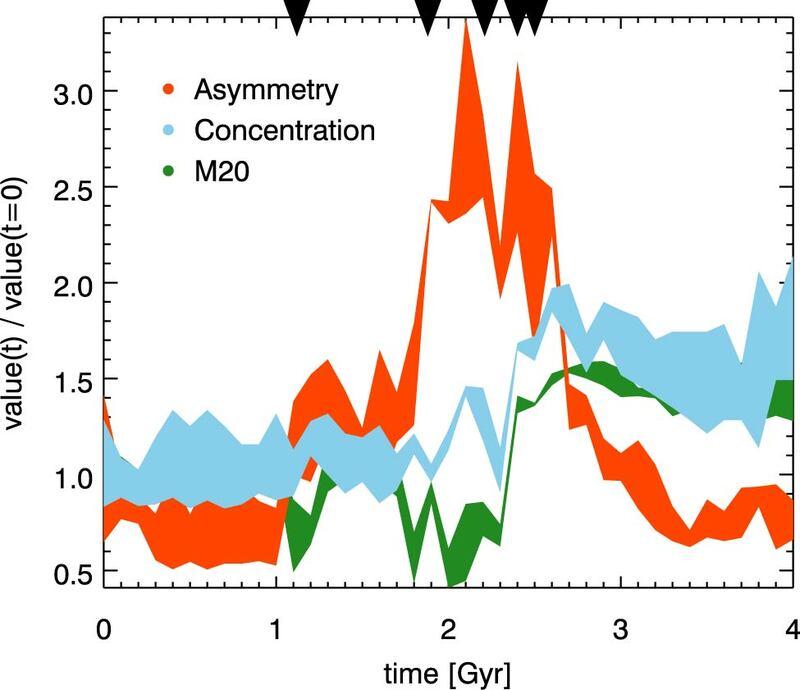 Figure 2: The galaxy became much more asymmetrical during the merger with the dark satellite (black triangles represent close-approaches), but only concentration and M20 (a similar measurement to concentration) remained elevated after the merger settled down. While some observed dwarf galaxies have properties similar to those predicted by the simulations, there is still a lot of wiggle-room left in the theory. There are many ways for similar morphological changes to occur, including a merger with a regular, non-dark satellite. As we gather more observations of dwarf galaxies, and improve our ability to simulate their mergers, there may come a day soon when we definitively find the smoking-gun signature of dark galaxies. Perhaps, that day, we will understand the power of the dark side. You guys do great work, you need a reblog button.